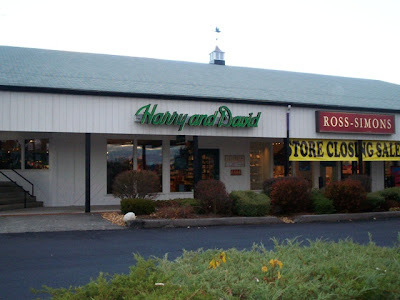 At one of the outlets in Kittery , Maine .....we came across this Harry & David store . 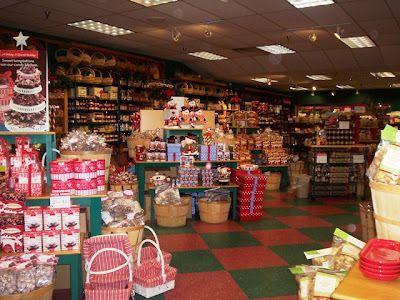 The stores carry a lot of what their catalogs have except for the crates of fresh fruits .They have all sorts of chocolate covered berries , pretzels , chips & cookies . They have fine chocolates and whimsical novelties . And ........they have MOOSE MUNCH ! This stuff is gooooood ! It's popcorn and sometimes nuts drizzled with different flavors ....chocolate , white chocolate , peanut butter and the ubiquitous glaze . It's crunchy and sweet and salty ....all at the same time . I bought a few bags for the Holidays and Laura and I also got some chocolate covered blueberries .....DELISH ! Everything I've ever tried here has been really fresh & tasty and the store itself is adorable . But all that country store cuteness doesn't come cheaply ......it's a little expensive . But , the items are usually unique and not something you can just find anywhere ....so I think it's not a bad deal . Come on .....it's good ......break a five !!!! !